If you’re considering a new cell phone service provider, be sure to take advantage of the wide variety of offers available now at the frequent flyer virtual malls. There are thousands of miles up for grabs for new customers. You can also earn bonus miles for just upgrading your current plan or buying a new phone. So you don’t need to drop your provider to collect some major miles. The biggest bonus for new cell service is at American Airlines eShopping. You can earn 4,300 AAdvantage miles with AT&T or Verizon. You must enter into a new two-year agreement. You can also get 3,300 AAdvantage miles from T-mobile or Sprint. T-Mobile no longer requires customers to enter into contracts. To get the bonus from Sprint, you must get a premium data plan or a data add-on. Southwest is offering the second largest bonus. If you are planning a move to Verizon or AT&T, you’ll earn 3,600 Rapid Rewards points for a new two-year service agreement. If T-Mobile or Sprint have what you’re looking for, you can earn 2,700 points. United’s MileagePlus Shopping mall is offering 2,600 miles with Verizon and AT&T. Plans with T-Mobile or Sprint earn 1,900 MileagePlus miles. All of the above offers are for new service. This means contract renewals and upgrades are not eligible. They require a two-year service agreement with the exception of T-Mobile. If don’t want new phone service and would rather just upgrade your existing plan, JetBlue may have the solution. Get 875 TrueBlue points for activating new mobile broadband access with T-Mobile. You’ll be able to use their network to get data on tablets and laptops. There are also JetBlue points available to Verizon customers. Get up to 750 TrueBlue points for buying Pre-Pay service or a Family Share plan, or for just adding an additional line to your existing service. 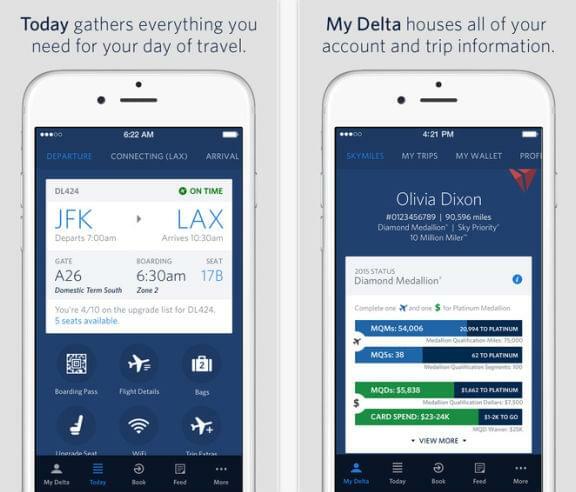 Delta Skymiles Shopping doesn’t have any deals with the major carriers. What they are offering might be even more valuable to you though. Not only can you get the 16 GB iPhone 6 for $199, but you’ll also get three miles per dollar spent on anything at the Apple Store. If you shop carefully, you can earn bonus miles while satisfying your mobile phone needs. Switch service providers, or upgrade your current plan or phone and start saving for your next award flight.